Unsuck DC Metro: Peep to the Right--Vote for Us! We don't much go for cute, but thanks to DCist, this was well, a must. We hate that little pink peep in the middle of the escalator effing everything up! How's that train going to make it through the tunnel? Mimicking Metro planning Hoffmann? 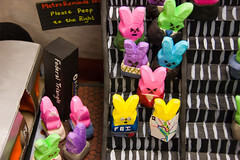 If I see one more peep on the metro I'm gonna get me some .... with a pair of pliers and a blow torch. "Please Step to the Right" should be the official DC motto.